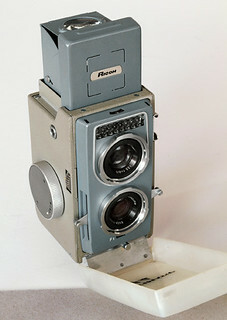 The Ricohmatic 44 (リコマチック44) is a Japanese 4×4 TLR made by Riken in 1959–60, during the brief 4×4 camera boom. In 1957, the release of the grey Baby Rolleiflex set a new trend for coloured 4×4cm TLR cameras. At the same time, various 4×4cm Kodak Brownie cameras made the format popular, notably because they produced colour slides which could be projected with standard 35mm projectors. In the wake of this, various auto-exposure 4×4cm cameras appeared in the United States in 1958–59, and two prototypes were announced in Japan in 1959, the Yashica Future 127 and Olympus Eye 44. 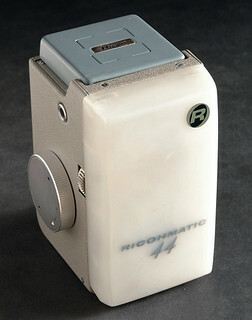 The same year, Riken offered the Ricohmatic 44 as an easy-to-use 4×4cm camera with a fancy design. The company spared the cost of developing a truly automatic exposure system, by using colour symbols for exposure control instead of the traditional speed and aperture numbers. In parallel, it also released the Ricoh Super 44, a straightforward TLR at a less expensive price. The Ricohmatic 44 has a characteristic boxy shape. The main body is all metal with a hammertone gray paint, a finish more usual on an industrial tool than on a camera. The front plate and viewing hood are painted in a different tone, and three colours were available, called "pearl gray", "straight gray" and "smoke blue". The camera has a front cover, hinged at the bottom and made of translucent white plastic. It is inscribed RICOHMATIC 44 in black or in red, and has a round R sticker at the top. This cover is released when the viewing hood is opened; advertisements said that it efficiently replaced a leather case, and no case was offered for the camera. The cover is also removable, and it is frequently broken or missing on the examples found today. Viewing hood, open and closed, showing the magnifying lens and contour finder. The hood has a magnifying lens hinged on the back and a RICOH nameplate at the front. The viewing screen has a Fresnel glass. The hood also has slits at the front, forming a square: this is an eye-level framing device similar to the Voigtländer Kontur finder, where you have to keep both eyes open and the bright line seen by one eye seems to float inside the image viewed by the other eye. The right side shows the advance knob and exposure (aperture) dial. The back shows the latch, film setting table and red window. The film is advanced and the shutter is cocked by a large knob on the photographer's right, with a white arrow indicating the turning direction. The film advance is manually controlled via a red window in the back, offset to the right and protected by a horizontally sliding cover. The L-shaped back is hinged at the bottom and is locked by a key at the top rear. There are specific strap attachments on both sides of the body. Front view showing the selenium cell at the top, the bayonet attachments and the two focusing levers on the sides. The camera is focused by two levers, protruding on either side of the front standard. They work together in opposite directions, controlling an internal helicoid moving the lenses back and forth. The user manual calls this system "duo-lever", and indicates that the levers should be driven by both thumbs. The distance scale is visible under the taking lens; it is engraved in metres and feet. The two levers must be set at infinity or at the closest distance in order to close the front cover. Exposure meter at the top, shutter release at the bottom. Once the sensitivity of the film is set (actually the shutter speed), the exposure is controlled by a meter placed above the viewing lens. The selenium cell is placed behind a honeycomb window and the needle runs under a small crescent-shaped window at the top of the front standard. The exposure knob, actually controlling the aperture, is on the right side plate, opposite the sensitivity knob. It directly interacts with the meter needle, which needs to be centred for proper exposure. It has a colour scale, used for flash exposure. The shutter release is at the bottom of the front standard, and there is a thread for a cable release at the bottom of the left side plate. There is a hot shoe on the same side, and no other flash connection is provided. Flash exposure is again a matter of "false automation": the "ASA knob" must be set on M, the appropriate flash bulb must be chosen according to the chosen film emulsion (depending on its sensitivity), then the colour of the number appearing in the distance scale must be matched on the colour scale of the exposure knob. The Ricohmatic 44 has a Ricoh 6cm f/3.5 three-element taking lens, with a five-digit serial number, and a Ricoh Viewer 6cm f/3.5 viewing lens with no number. Both have bayonet attachments for filters and other accessories. The taking lens is certainly the same as that of the Ricoh Super 44. The original box is black and white, with 44 in pink and gray. It sports the camera name, the company name RIKEN OPTICAL INDUSTRIES, LTD. and the film format. It originally contained the camera, shoulder strap and instruction manual; the camera's front cover was protected by a green felt band, marked RICOHMATIC 44. The dimensions of the camera are 65×87×121mm and the weight is 730g, according to a contemporary brochure. The earliest mention of the Ricohmatic 44 found so far is in an issue of Kōgei News dated April 1959 (a bulletin of the AIST). The pictured camera is certainly a prototype, and has some differences with the production version: there is no bayonet attachment, the cable release thread is located differently, to the rear of the left side plate, the round R sticker and RICOH logo are swapped, and the front cover has the name PERFECT instead of RICOHMATIC 44. The camera is called Ricohmatic 44 in the article, but the name "Perfect" was perhaps considered at an earlier date. The dimensions and weight are 121×81.5×77mm and 700g, quite different from those indicated in the commercial brochure cited above. The Ricohmatic 44 appeared in Japanese camera magazines dated May and June 1959. Some magazines featured the camera again in October or November, perhaps for its actual commercial launch, and it was first advertised in November. The last reported advertisements are dated June 1960. The price in Japan was ¥12,000. Some accessories were offered for the camera: filters, a hood, a self-timer screwed into the cable release thread, and a flash gun. ↑ In the original documents, the "o" of "Ricohmatic" (リコマチック, Rikomachikku) is short, unlike the "o" of "Ricoh" (リコー, Rikō). Today, the camera is often called リコーマチック44 in Japan. ↑ Brochure reproduced in Akira Ota's website: エレガントなパールグレー (elegant pearl grey), シックなストレートグレー (chic straight gray), デリカシーのすもーくブルー (delicate smoke blue). ↑ Brochure reproduced in Akira Ota's website. ↑ Kokusan kamera no rekishi, p.415, says 1/30, 1/100, 1/200. Hagiya, p.32 of Kurashikku Kamera Senka no.14, says 1/25, 1/100, 1/200, with an intermediary 1/50 setting indicated by a dot. The same author, p.139 of Kurashikku Kamera Senka no.4, says 1/32, 1/50, 1/100 and 1/170. Sugiyama, item 2246, and McKeown, p.833, say 1/32 to 1/170. ↑ Three elements: Kokusan kamera no rekishi, p.415. ↑ Pictures of an unused set observed in an online auction. ↑ "IAN Spotlight: Ricohmatic 44", available in pdf version in the AIST Tohoku website. ↑ 10.0 10.1 10.2 Kokusan kamera no rekishi, p.415. Hayashi Teruaki (林輝昭). "Kamera taishūka no kōrōsha Rikōfurekkusu" (カメラ大衆化の功労者リコーフレックス, The Ricohflex, a deserving effort to popularize cameras). Kamera Rebyū: Kurashikku Kamera Senka (カメラレビュー クラシックカメラ専科) / Camera Review: All about Historical Cameras no.4, March 1984. No ISBN number. Meiki no keifu (名機の系譜, special issue on famous camera families). Pp.136–9. Hayashi Teruaki (林輝昭). "Sengo no kamera 1: Nigan-refu kamera" (戦後のカメラ1・二眼レフカメラ, Postwar cameras 1: TLR cameras). Kamera Rebyū: Kurashikku Kamera Senka (カメラレビュー クラシックカメラ専科) / Camera Review: All about Historical Cameras no.14, October 1989. No ISBN number. Rikō kamera no subete (リコーカメラのすべて, special issue on Ricoh). Pp.26–32. Lewis, Gordon, ed. The History of the Japanese Camera. Rochester, N.Y.: George Eastman House, International Museum of Photography & Film, 1991. ISBN 0-935398-17-1 (paper), 0-935398-16-3 (hard). Pp.98 and 103. McKeown, James M. and Joan C. McKeown's Price Guide to Antique and Classic Cameras, 12th Edition, 2005-2006. USA, Centennial Photo Service, 2004. ISBN 0-931838-40-1 (hardcover). ISBN 0-931838-41-X (softcover). P.833. Sugiyama, Kōichi (杉山浩一); Naoi, Hiroaki (直井浩明); Bullock, John R. The Collector's Guide to Japanese Cameras. 国産カメラ図鑑 (Kokusan kamera zukan). Tokyo: Asahi Sonorama, 1985. ISBN 4-257-03187-5. Item 2246. Watakushi no ni-gan-refu kamera-ten (私の二眼レフカメラ展, Exhibition of twin lens reflex cameras). Tokyo: JCII Camera Museum, 1992. (Exhibition catalogue, no ISBN number.) P.22. This page was last edited on 6 October 2017, at 10:38.